Among the issues Apprising Ministries covers is how even the heretical Word Faith movement continues heading toward acceptance within the mainstream of evangelicalism during this nauseating New Downgrade No-Controversy. See for yourself e.g. in Steven Furtick Bringin’ On Word Faith And The Pastrixes or Word Faith Heretic Cindy Trimm Receives Award From Billy Graham Evangelistic Association or James MacDonald, T.D. Jakes, And Postmodern Obfuscation. Keep in mind with this last article, that MacDonald is associated with the Young, Restless, and Reformed crowd, as well as being a Gospel Coalition Council Member and caretaker of The Elephant Room discussions. Translation: Boo hoo, I don’t want to be held accountable to answerring the facts of said criticism. What I’m going to do here, yet again, is systematically present the evidence—as would a lawyer—to further make the case that heretical Word Faith prosperity preachers are gaining evangelical acceptance. While this is basically Furtick’s bio; but since MacDonald knows where Furtick stands, I offer that adding they “are privileged to again have,” makes this now read rather like an endorsement. 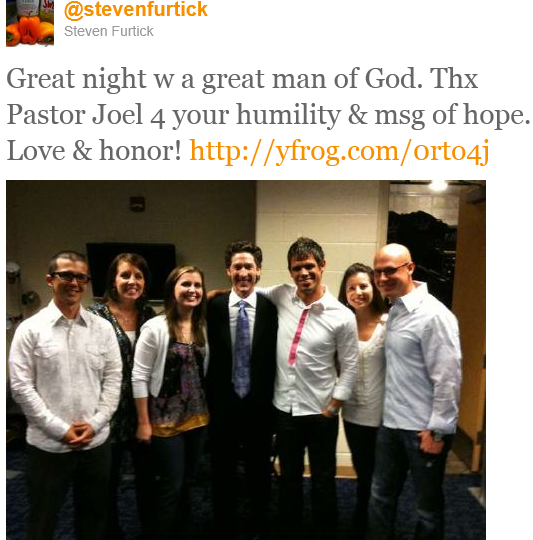 Even more so when we consider “The Steven Furtick Show” Played At Harvest Bible Chapel Of James MacDonald. 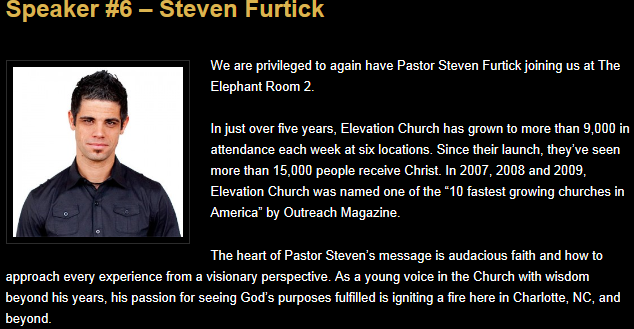 Be all this as it may, I’ve shown you again in Steven Furtick And Word Faith Heresy where P-P Furtick is headed. 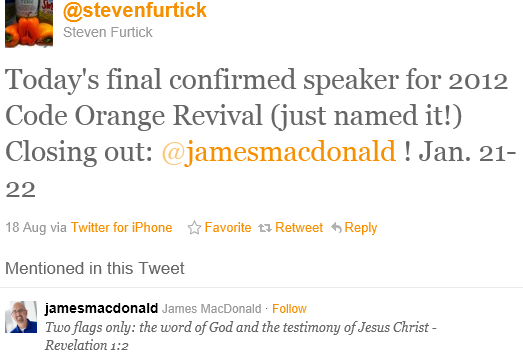 Being told GC member MacDonald feels privileged to discourse with Steven Furtick now gives us more than enough reason to call P-P Furtick to the stand as it were and examine him further. This truly brings Furtick’s discernment into question because I’ve clearly shown in Smile When You Lie that Joel Osteen is a preacher of Word Faith heresy. That’s hardly something a great man of God would do. 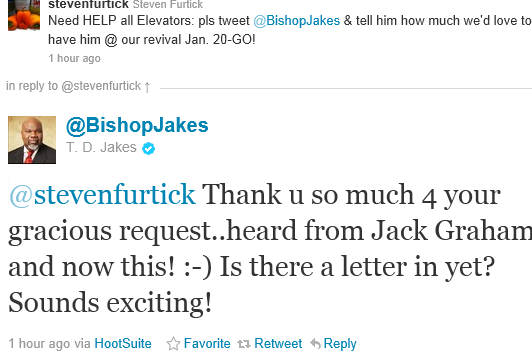 We also know that Steven Furtick is a huge fan of another WF mogul, T.D. Jakes. And to think, they’ll all be in ER2 as well. 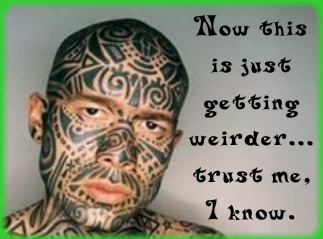 Now that Steven Furtick has introduced T.D. Jakes into evidence let me point you again to the following video from the 9/1/11 edition of TBN’s Praise the Lord program. 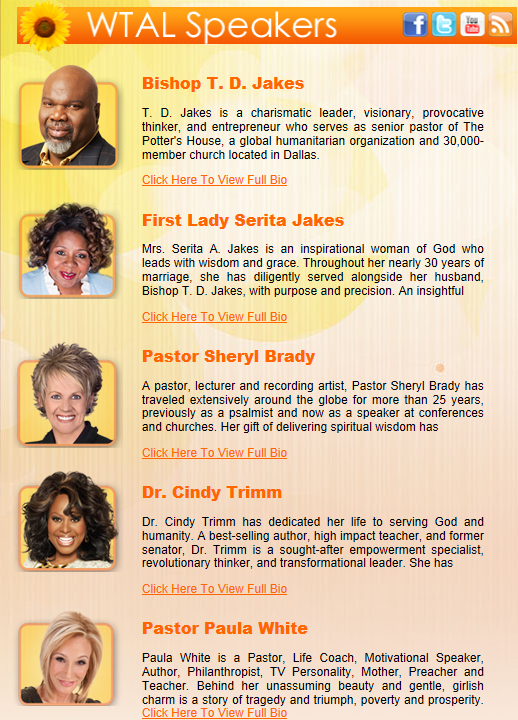 The three WF pastrixes he introduces below are featured speakers at his Woman Thou Art Loosed 2011 next month. The first is pastrix Paula White, whom Jakes calls “pastor extraordinaire.” You’ll hear her tell Jakes he’s her “spiritual father.” Next is pastrix Cindy Trimm, essentially a female version of himself, and amazingly Word Faith Heretic Cindy Trimm Receives Award From Billy Graham Evangelistic Association.